This guide will show you how to block the “Mailto:” links in your Google Chrome browser. If you simply don’t want your email client to open up every time you click on such links, the fix we have prepared in the guide below may be exactly what you need to get this problem solved. Have you ever found yourself on some websites and when you click a contact form or a “Contact us” button, a “Mailto:” link would automatically prompt you to your default email client? Many websites actually use this form of contact, especially those who provide assistance and support or feedback. It may be comfortable for some users to simply click on such direct ‘Mailto:’ link and have their email open, however, not all of them may want to use this function. Generally, what the ‘Mailto:’ link does is it automatically opens the email client that is set by default. In Windows 10 this is the Mail app, while in other Windows versions it could be Outlook or Thunderbird. The Mac OS users may usually be prompted to the Mail app. And while this is functional for some users, others may not find it desirable to activate their email every now and then when they click on some website contacts or links. For those of you, we have listed the solution below. Whether you want to disable the Mailto: links from opening an email client and getting your taskbar cluttered with Outlook, or you would rather want to be prompted to choose how to handle the Mailto: link request, the fix that we have here may be worth checking out. The solution that you may be looking for is called “NoMailto:”. This is an open source Chrome extension, which we found very helpful in two ways – it prevents “Mailto:” links from opening your email client and it gives you the option to simply copy the email address to your clipboard. On top of that, it is really easy to install and work with it as well. The only thing you need in order to block your Mailto: links is to download “NoMailto:” and install it. This could easily be done from the Chrome Web Store. Once you install it in your Google Chrome, you can continue your browsing just like before. 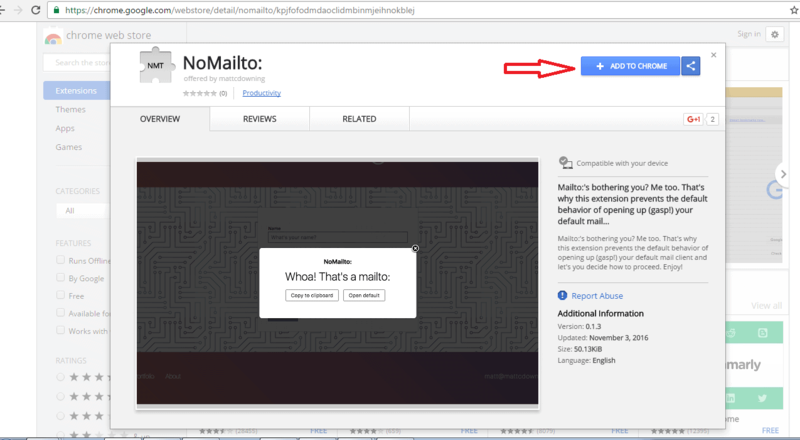 The only difference is that when “NoMailto:” is activated, the next time you come across a “Contact us” button or a link that is a Mailto: link, a handy pop-up window will appear. That pop-up window will prompt you to two options which you can choose from – whether to “Copy to clipboard” or “Open default”. If you choose the “Copy to clipboard” option, the extension will copy the email address from the Mailto: link to your clipboard. If you click on the “Open default” option, it will open your default email client. This way you can easily have control over what action you wish to perform with the Mailto: link. However, as great and as functional as it is, we need to warn you that “NoMailto:” is not perfect and has its bugs. From what we have tested, it seems that it does not work on all types of Mailto: links and a few times it failed to ask us whether to open the email client and which app it should handle the link with. Also, the pop-up didn’t appear in the center of the page as usual and we needed to scroll down to see it. This could be a bit confusing if you don’t know where to look for it, however, most of the time this extension did a pretty good job in blocking the Mailto: links, so it may be worth giving it a try.